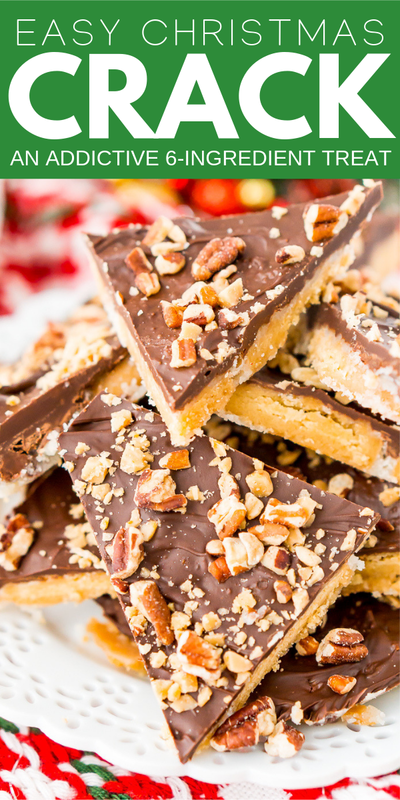 This Shortbread Christmas Crack is insanely easy to make and even more delicious! 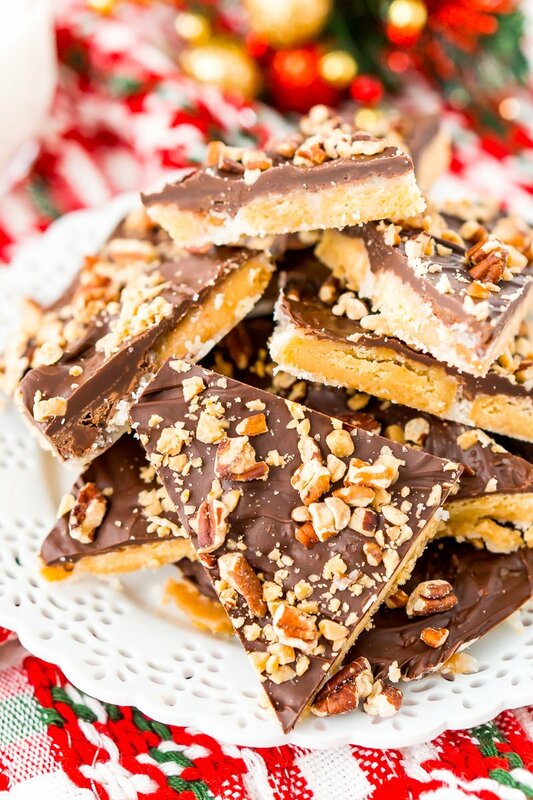 Made with shortbread cookies, butter, sugar, chocolate, pecans, and toffee bits. I’m sure you’ve all had Christmas Crack at least once in your life. It’s that perfectly addictive blend of sweet, salty, and chocolaty. And it’s hard to forget! 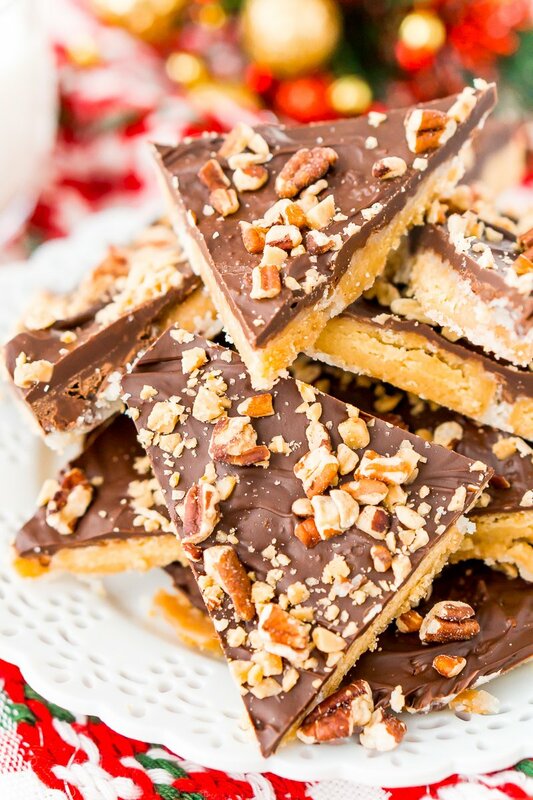 Traditionally, you see Christmas Crack made with saltine or Ritz crackers and occasionally graham crackers too, but this shortbread cookie version takes this easy treat to a whole new level of deliciousness! Shortbread Cookies are a total weakness for me and you might recall that I pretty much survived off of them for a couple of days in Scotland a few years back. 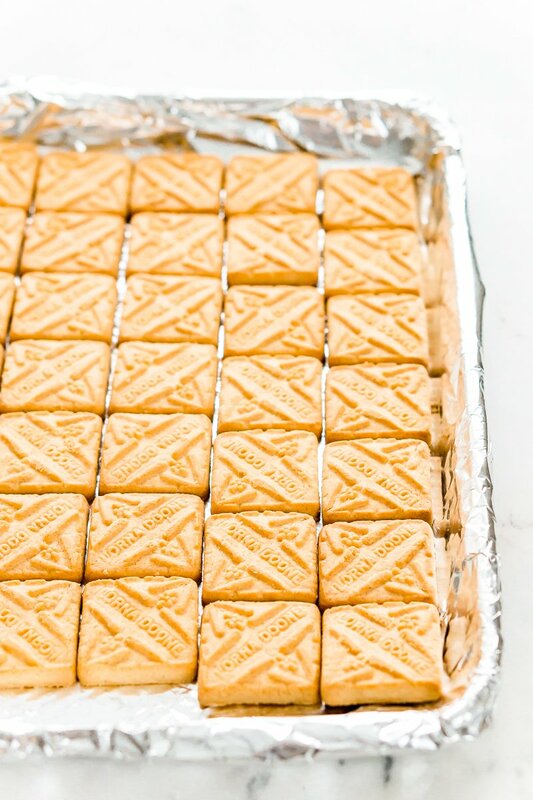 So I love making them and using them in my recipes so switching out the crackers for shortbread cookies seemed like a no-brainer. You’re probably thinking it might be a bit overkill to use a sugar and butter based cookie in a recipe where the cookies get slathered in sugar and butter. But no, it’s not overkill. 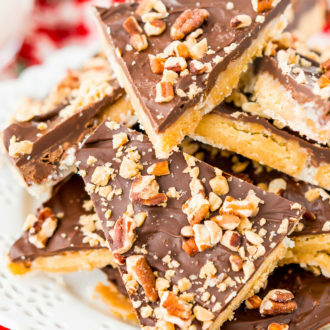 Christmas Crack to be exact! Guys, I love this recipe mostly because of how good it is but secondly because of how EASY it is! There’s no need for a candy thermometer or special tools or skills and even the kids can get in on helping you make this one! Preheat the oven and line your baking pan with foil, then arrange the cookies in a single layer on the pan. Melt the butter and add the sugar, then bring the mixture to a boil for a few minutes before pouring it over the top of the cookies. Sprinkle the cookies with mini chocolate chips and let soften. Use a rubber spatula to spread the melted chocolate chips all over the top of the cookie mixture. Sprinkle the melted chocolate with chopped pecans and toffee bits. Refrigerate until hard. Cut into pieces with a knife and enjoy! This Shortbread Christmas Crack will stay fresh for about 1 week in an airtight container either in the fridge or pantry. Avoid overly warm areas so the butter and chocolate don’t melt while stored. 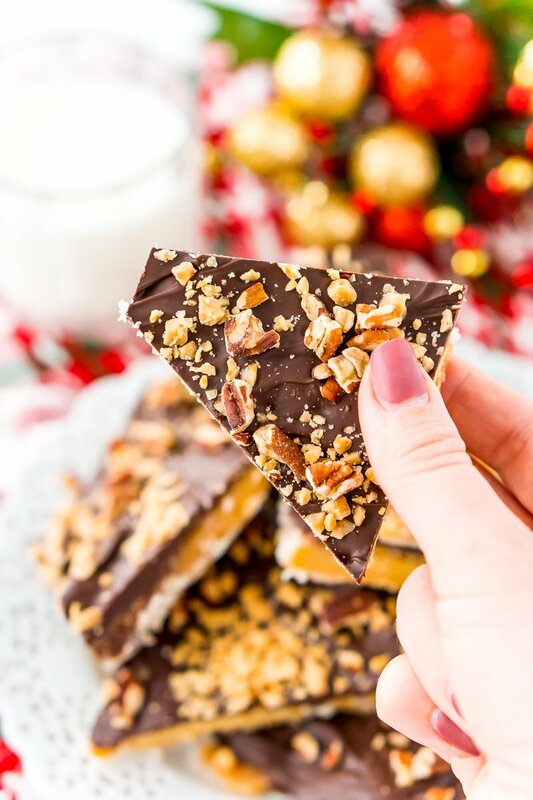 Can I Freeze Christmas Crack? I wouldn’t. The cookies would likely become quite mushy once they defrosted. Because I traded in a salty cracker for a sweet cookie, I use salted butter in the recipe, but you could use unsalted if you’d like. If you have a nut allergy, the pecans can be omitted altogether or replaced with another delicious topping like coconut flakes or m&m’s. 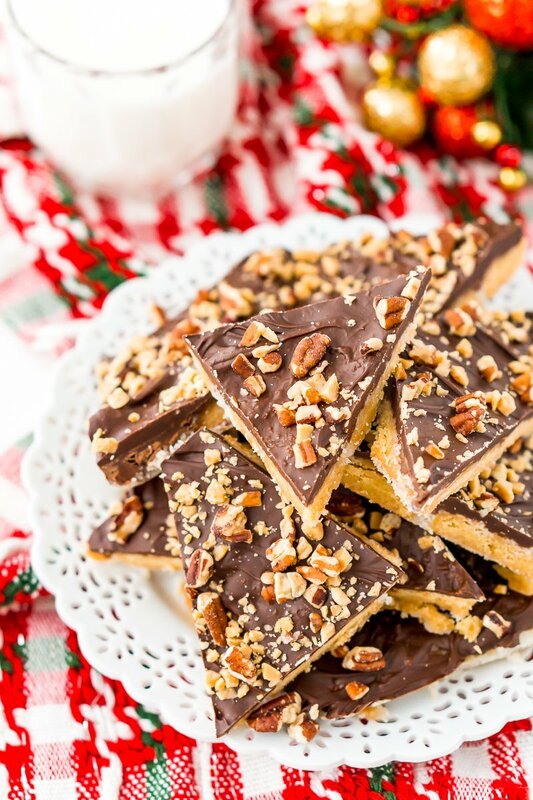 Sea salt makes a delicious addition to this holiday treat! Also, a drizzle of white chocolate is another sweet twist! This is such a great treat for sharing with family and friends. Package it up in cute gift boxes and get everyone addicted to this Christmas Crack recipe too! Preheat the oven to 350 degrees F and line a 9x13-inch baking pan with aluminum foil, make sure your pan has a lip. Arrange the cookies in a single layer on the prepared baking sheet and set aside. In a medium saucepan, melt the butter over medium heat then add in the sugar. Bring the mixture to a boil and boil for 3 to 4 minutes, making sure the sugar has fully dissolved. Pour the butter mixture over the cookies making sure to fully coat. Transfer the pan to the oven and bake for 8 to 10 minutes or until bubbly. Immediately after removing from the oven, sprinkle the mini chocolate chips over the top of the bubbly cookies and let sit for a few minutes. Once the chocolate chips look shiny, use a rubber spatula to spread the chocolate out to cover the cookies. 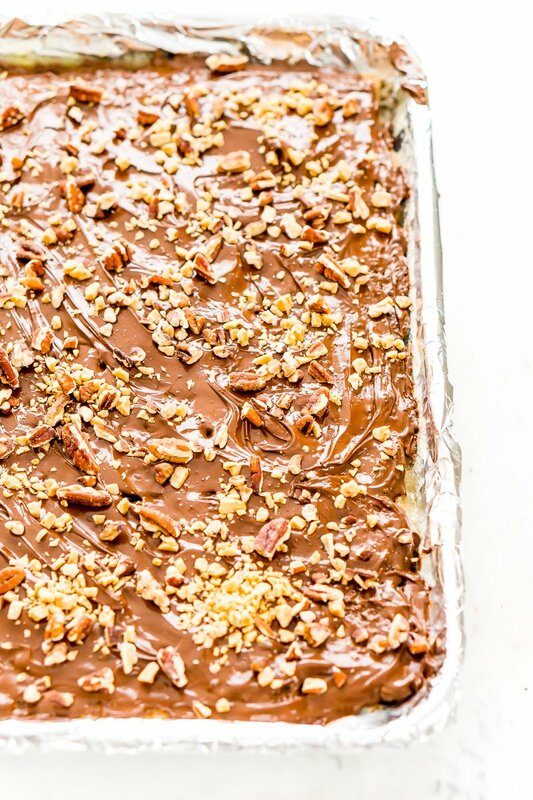 Sprinkle the melted chocolate with chopped pecans and toffee bits. Place the pan in the refrigerator to chill for 1 to 2 hours. Remove from the fridge and cut into pieces and enjoy! Oh my! This does look delicious and easy too!